We know you’re excited. We are too. Taiwan’s favorite xiao long bao paradise will open its doors in Manila in a couple of days and to help ease the pain of waiting, here’s everything you need to know about Din Tai Fung in the Philippines. You have The Moment Group (the company behind 8Cuts Burger Blends, Manam Comfort Filipino, Cue Modern Barbecue, Ooma, Phat Pho Manila, Linguini Fini Manila, Bistro M, Mecha Uma and Bank Bar) to thank for the xiao long bao awesomeness that’s about to come your way. The Moment Group’s Eliza Antonino, Abba Napa and Jon Syjuco have been long-time fans of Din Tai Fung. 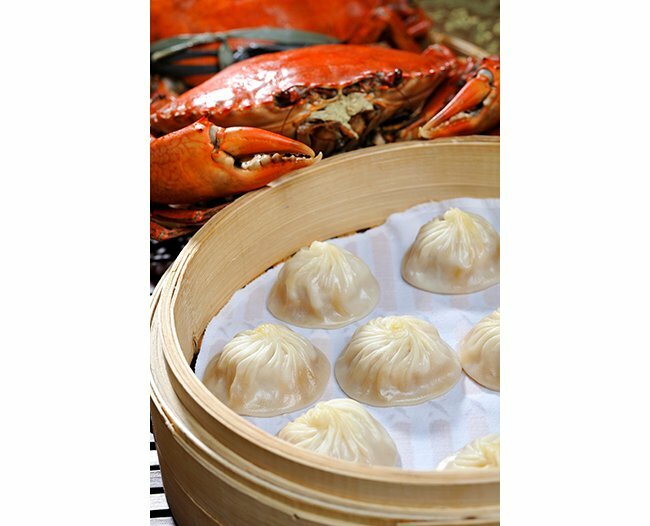 Din Tai Fung, which started as a cooking oil shop in Taiwan in the 1950s, became famous for its xiao long bao, delicious steamed soup-filled dumplings that have earned them praises and rave reviews. There are Din Tai Fung restaurants in different parts of the world including the United States, Australia, Singapore, Malaysia, China and Dubai. Din Tai Fung’s Hong Kong branch has been awarded a Michelin star every year since 2010. It took The Moment Group two years to woo Din Tai Fung. “It was literally a courtship. Some things come easy, some things come hard and this was something we really really had to work for. There was a language difference, a lot of the people who were pitching could speak the language which would make their meetings thirty minutes while ours would be four hours. All our presentations had to be translated. That made it quite intense,” said Jon. It takes three days to make one xiao long bao. A perfect soup-filled dumpling has just eighteen folds. “It takes a whole long process (before you can) put that small little dumpling in your mouth. No shortcuts,” said Eliza. Today, Lysa is Din Tai Fung Philippines’ kitchen manager while Rhey Huergas, The Moment Group’s first employee and first chef, is executive chef. There are twenty Taiwanese Din Tai Fung employees who will be staying in Manila for three months to help make sure that everything is running smoothly. Din Tai Fung opens its doors to the public on December 8, 11 a.m., at the ground floor of Mega Fashion Hall. Din Tai Fung founder and owner Bingyi Yang will be in town for the launch. They are ready for the crazy lines. They will be using the same number queueing system Din Tai Fung has in Taiwan. Just make sure you tell your friends to arrive on time—parties won’t be seated until they are complete. “We seat according to party size,” said Eliza. There will be no limit—you can eat as many baskets of xiao long bao as you want. “We don’t want to deprive anyone,” said Eliza. ”We have 27 dumpling chefs in the front kitchen. They’re trained to do the turns that Taiwan is doing.” Din Tai Fung’s Taipei 101 branch, which seats 330 people, serves 16,000 pieces of xiao long bao every day. To prove to you their commitment to great service, here’s an interesting fact: Din Tai Fung Philippines has 164 seats and 167 employees. They have a front kitchen, a back kitchen and a central kitchen all working to serve you. First time at Din Tai Fung? Order the pork xiao long bao. “I expect every table to have pork xiao long bao,” said Eliza. From December 8 to 15, the first 50 tables will get a free basket of pork xiao long bao—a small basket of 5 pieces if there are five people or less in your group and a big basket if there are six people or more at your table. Not sure what else to order? You might want to try the favorites Jon and Eliza’s favorites, after all they’ve eaten at Din Tai Fung countless times. Even if you’re a regular at the Din Tai Fung branches abroad, Din Tai Fung Philippines still has surprises in store for you. There are dishes that will only be served here like the crispy beef, salted egg yolk prawns, sweet and sour pork and choco lava xiao long bao. Still not sure about the right way to eat xiao long bao? There will be a guide at each table to take you through the steps. “To enjoy eating the pork xiao long bao, we recommend that you pick it up using the chopstick on the top, put it on the sauce, put it on the spoon, poke a hole so the sauce comes out and then sip the broth and put some ginger on top and bite,“ said Eliza. Make xiao long bao sauce by pouring soy sauce and rice vinegar over ginger. Make sure you pour the soy sauce first and that use you use one part of soy sauce and three parts of vinegar. Din Tai Fung’s soy sauce is brewed especially for the brand in Taiwan—it’s non-GMO. Daunted by the challenge of getting the ratio right? Don’t worry, the staff of Din Tai Fung can make the sauce for you. But if you’re eating truffle and pork xiao long bao, skip the sauce. Eat it on its own so you can enjoy the truffle taste. “Use a different spoon and saucer for the truffle so it doesn’t mix and drink to clean your palate,” said Eliza. Or, better yet, start your meal by eating the truffle and pork xiao long bao. “Each truffle xiao long bao has at least one gram of real truffle but of course it still has truffle paste, truffle salt, truffle oil,” Eliza added. Jon added, “We are priced so our customers can get a great meal, good value, get full and satisfied without spending too much. We are priced very very competitively.” A five-piece order of pork xiao long bao costs P160 while a ten-piece order is P315. The most expensive item on the menu: the truffle and pork xiao long bao which costs P135 per piece. But if you’re a truffle fan like we are, trust us, it’s worth it. You won’t be paying for your meal at the table. You will do it the Taiwanese way—you’ll stop by the cashier and pay on your way out. And yes, Din Tai Fung accepts cash and credit cards. Sorry, you can’t order your xiao long bao to go. It’s best eaten hot anyway. Use the hashtags #XLBisDTF #DinTaiFungPH to join the conversation. For more on Din Tai Fung Philippines, pick up a copy of Inquirer’s December 6 issue. The way to order Xiao Long Bao to go is to skip the steaming process at the restaurant. Make sure it is packed nicely in a to-go container underneath a steam paper. It makes it easier to transfer to a steamer. Steam it at home for 6 minutes and then devour that sucker immediately with black vinegar (I use the Chinkiang brand) and ginger. Finally! I don’t have to fly to Taiwan or HKG anymore for my Din Tai Fung fix.